Your first batch of kombucha needs to break in the fledgling baby SCOBY that you're nursing; in other words, don't expect to dump it into a big 5 gallon bucket of tea right away. It will take a few batches until your SCOBY is at full strength, but you'll still be making great kombucha along the way. So, start out a little smaller with your first batch — a quarter to a half gallon should be good. Next time around, brew a gallon. By the third or fourth batch, you can probably go as big as you want. Other than your SCOBY, you will need something to brew the kombucha in, something to bottle the kombucha in, and some means of getting the kombucha into the bottles. But let's start with the brewing vessel — most people brew a gallon to two gallons at a time. (In my experience, if you keep up with a steady fermentation/bottling cycle, a gallon and a half batch amounts to around a bottle a day — which is perfect.) You'll want to ferment the kombucha in a large all-glass vessel with a broad open top. I got a perfectly-sized two gallon glass vessel at Target: something like this. Making the beverage that you will actually drink is very simple, from Your, The Brewer's perspective. Basically: make a big batch of tea. I use 8 teabags for a one gallon batch (~12 for a 1.5 gallon batch). I also like to mix green and black tea — you should probably stick to basic tea types and avoid anything with crazy flavors or spices. For your first batch, which should only be a half gallon at most, use three or four teabags. It's not an exact science — just adjust the ratios depending on how much you're making. Same idea with the sugar: I use one cup of table sugar per gallon, approximately. Dissolve your sugar into a cup or two of boiling water, pour that into a gallon of lukewarm water, add your teabags, and you have tea. You can make tea, right? Great! Now, let your tea cool to room temperature. This is important (especially for your first few batches when it's somewhat easier to forget that you're not just making tea.) Your SCOBY doesn't enjoy being burned with scalding hot water any more than you do. So make the tea in advance, go read a book for half an hour, and then come back. Now, with the tea cooled to room temperature, pour the tea into your big glass vessel with the SCOBY. Here, dear reader, is where you learn a valuable trick that only bear-flavored.com will give you: grab a tiny dinner plate. Hold this inside the rim of the glass vessel, angled toward the wall, so that the tea, pouring into the vessel, simply cascades down the wall and not directly into the center. Until your SCOBY is fully formed, multiple pancakes deep, and impervious to outside physical forces, you don't really want to go pouring a gallon of tea directly on top of it, sending it bouncing and flopping and splashing around inside your fermentation jar. For one, it looks ****ing gross. And two, it's probably not great for the SCOBY, putting a hole through the center of it. Eventually, however, your SCOBY will become thick and solid, actually leather-like in consistency, and you can probably ditch the plate at that point. This is the easy part: the SCOBY will do all the work, and you just have to wait. To ensure that your SCOBY isn't ill-treated while it's doing its thing, first, cover the glass jar with some kind of clean, air-permeable cloth, like a cheesecloth or a towel. Then, to make sure nothing but air can crawl in there, secure the cloth around the top of the fermentation vessel with a thick rubber band. Set it in a dark place, out of harm's way. Note: do not ever store your SCOBY in a refrigerator. Fridges are basically dehumidifiers, and the worst thing you can do is to dry out your SCOBY. 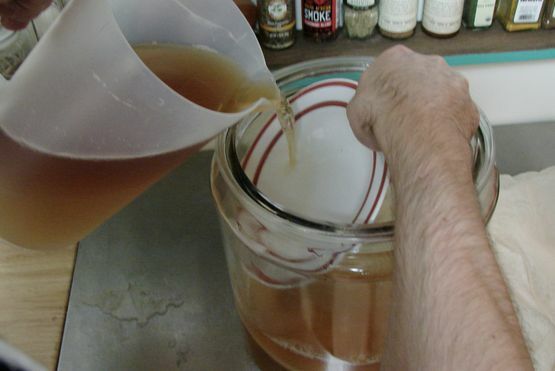 Always store your SCOBY at room temp, even if you aren't brewing with it at the moment. How long should you let your kombucha ferment? In my experience, it's not an exact science, particularly if you're bottling your kombucha afterward. I usually go 10 to 14 days, depending on how busy (lazy) I am. Your kombucha will become a little more sour the longer you let it ferment, although I think this is more directly related to how much sugar you add (more sugar equals more sour). For your first batch, while the SCOBY is still small and weak, you will probably want to let it ferment a bit longer. Once you have a regular cycle going, experiment with anywhere between one to three weeks, based on your tastes and schedule. The SCOBY itself will remain healthy for months, if stored properly. has your hand always been that hairy? Can you tell me how to go about raising the alcohol percentage in the kombucha? Adding more sugar to start would raise the alcohol. (Adding less, of course, would lower it.) Because there's more sugar for the SCOBY to ferment, you'll probably need to give the kombucha a few extra days to make sure it's done. However, you don't want to give it too long either... the sourness in kombucha is partially, sometimes largely, acetic acid produced by acetobacter bacteria, which actually feeds off of alcohol and converts it into acetic acid (the sourness of vinegar.) So adding more sugar will give you more alcohol, but also potentially more vinegary sourness over a long period of time.